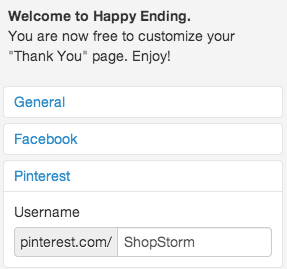 Can I add Pinterest to my Happy Checkout page? You may then configure which button styles you'd like to use and whether to add a follow button. Once this is configured, the Pinterest widget will be added to the "Thank You" page. This will allow customers to follow you, or to pin any products they just purchased to their own boards!